Have a drink while throwing an ax at the new Kick Axe Throwing bar. Lumberjacks aren’t the only people who can throw an ax. For $35 per person, you can put your ax-throwing skills to the test at Kick Axe Throwing in Brooklyn. Don’t worry about the fact that you may have never thrown an ax before. 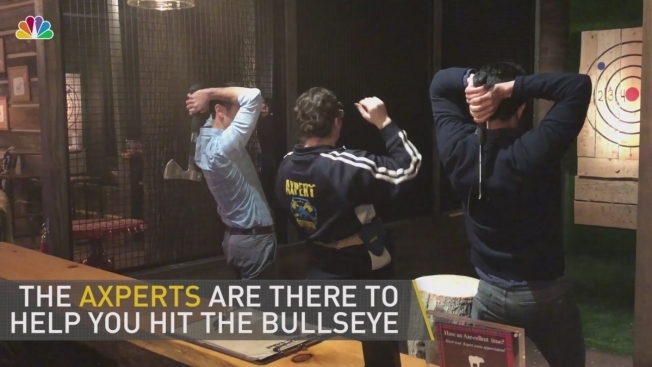 The Axperts are there to take you through a step-by-step process of hitting the bullseye. “When throwing the ax it’s not about strength but weight [that you use to throw the ax],” Kick Axe Throwing spokesperson Robert Marin said. If you want to hit one of the blue 'sweet spots' on the board, make sure you yell out “kill shot” so the whole venue can cheer you on. This is not just a time for throwing axes at a wall, you have the chance to compete in games while enjoying wine or beer from the bar. “We are an ax throwing venue with a bar opposed to a bar with ax throwing," Marin said. There are 10 ranges available and a group of 10 people can play on a team. If you bring less than 10 friends your party will be placed with another group. Ages 7 and up are welcome so the whole family can get in on the fun.